Mornington Crescent, in Camden Town. When laying out their new housing estates in the eighteenth and nineteenth centuries, ground landlords had realised that houses with gardens behind and private squares in front, would be more attractive than dense rows of terraced streets. To attract a `good quality' of tenant and to continue to hold them, ground landlords laid down the number of houses to be built per acre, the value of the properties to be erected, insist­ed on householders repainting the properties at regular intervals and made annual maintenance inspections. 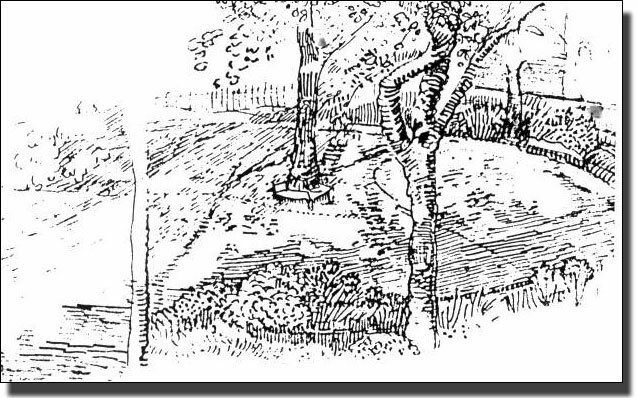 In addition many landlords laid out private gardens in squares, crescents or circles to give fresh air and green spaces near the houses. Householders paid a Garden Tax each year for the right to use the gardens, and were given a key to the private, railed garden in front of their houses. Purchasers valued the healthy living conditions, the open sky and the attractive trees. By the time that house building slowed down at the start of the First World War, there were said to be 40,000 `squares' in Greater London, of all shapes and sizes. Mornington Crescent, a typical example, was built as a sweep of houses, with gardens and tennis courts in front. At the beginning of the twentieth century the area, with large rooms suitable for studios, became popular with artists. Sickert lived at No. 6, while Gore had lodgings in the Crescent and Gilman, another of the Camden Town Group, lived nearby in Cumberland Market. When Walter Sickert came back to London in 1905, after seven years abroad, mostly based in Dieppe, he became the doyen of a group of young painters. They took their inspiration from the dingy streets and lodgings houses of Camden Town. Indeed one of Sickert's most famous paintings is `The Camden Town Murder', a sordid but pitiful affair. The Camden Town artists painted the streets, the cafes, the gardens behind their lodgings, the public parks and the music halls. The Bedford Music Hall, in its worn Victorian red and gilt, was a favourite subject, especially for Sickert. Over the years, Sickert ran several painting schools in the area, which drew in other artists. There were links with the Bloomsbury Group through Vanessa Bell and Duncan Grant, who both painted with them. The artists varied in their subjects and palettes, but they exhibited together and became a very influential group. Mornington Crescent Gardens was an important open space in these sooty, bedraggled streets. It was the subject of several paintings and drawings. As Camden Town went down, houses were let in floors and rooms, often with cooking facilities on landings. Tenants and sub-tenants moved in and out frequently, making the garden tax difficult to collect. The gardens were no longer maintained, the tennis courts fell into disrepair and the Crescent became a wasteland. One man remembers as a young boy, walking across this rough ground from his home in Delancey Street to the Tolmer Cinema, at the corner of Euston Road and Hampstead Road, where the Tolmer Estate now stands, to see Tom Mix or Rin Tin Tin, for a penny. Sometimes a small fair was held in the Gardens, or a travelling circus appeared. It became a village green, untended but friendly. After some years the site was boarded all round with poster hoardings. Slowly the news filtered out that the land, long regarded as a public open space, had been bought by some unknown developer. This caused a great public outcry and linked Mornington Crescent Gardens to the far wider campaign for public open spaces. Mornington Crescent was only one of the many London squares and crescents under threat by developers in the nineteen twenties. Another was Endsleigh Gardens, opposite Euston Station. It had been an open space full of trees, but was now lost to the public. This is the block which now contains the Friends' Meeting House. 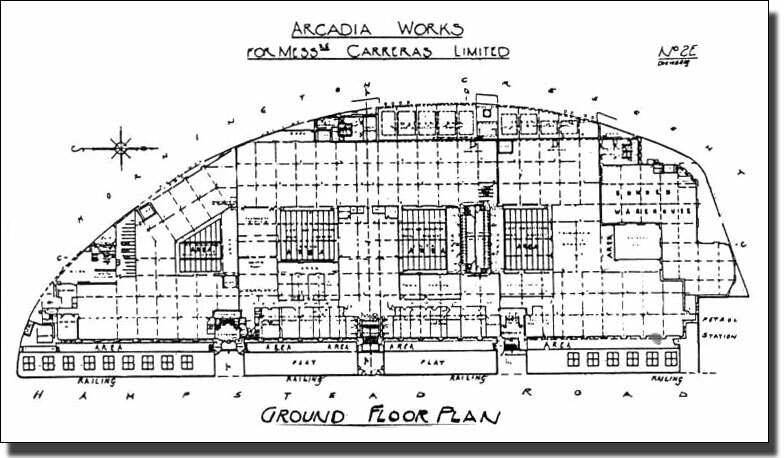 Coram Fields (now buried inder the Brunswick Centre) and many other green lungs, were under similar threat. 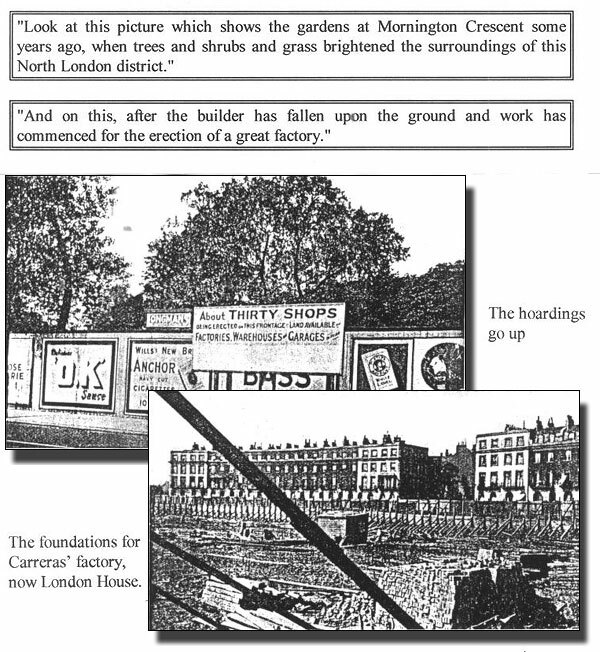 In April 1928, `New Health', a periodical which fought for open spaces in cities and the health which they could bring, was up in arms about the planned loss of Mornington Crescent Gardens. Fresh air was then the sole known cure for killer diseases such as tuberculosis. Streptomycin, which emptied our TB hospitals in the early sixties, was thirty years away. New Health contrasted the trees and open space with the effects of a new factory on the area. The Campaign to save Mornington Crescent Gardens was lost. but probably contributed to the idea of Zoning of Industry and the creation of the New Towns around our major cities. 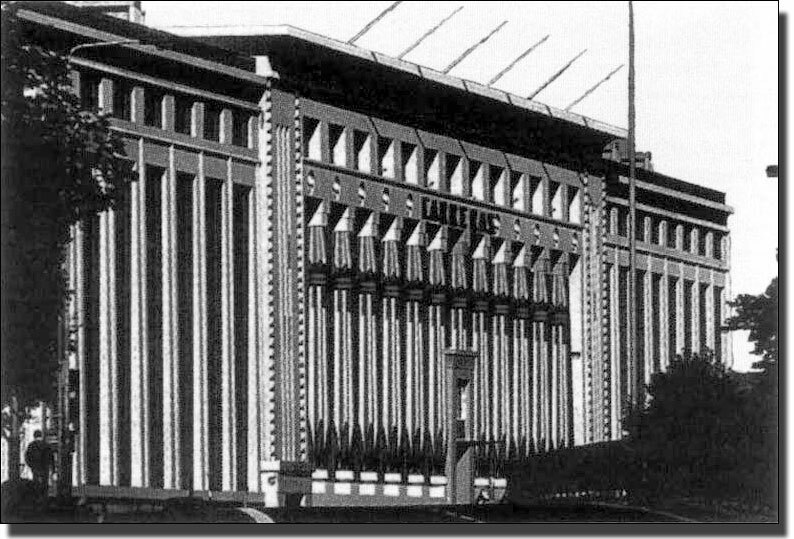 The huge factory built over the valuable garden space of Mornington Crescent, Camden Town. Architect M.E. and O.H. Collins. Contractors, Sir Robert Mc Alpine & Sons. 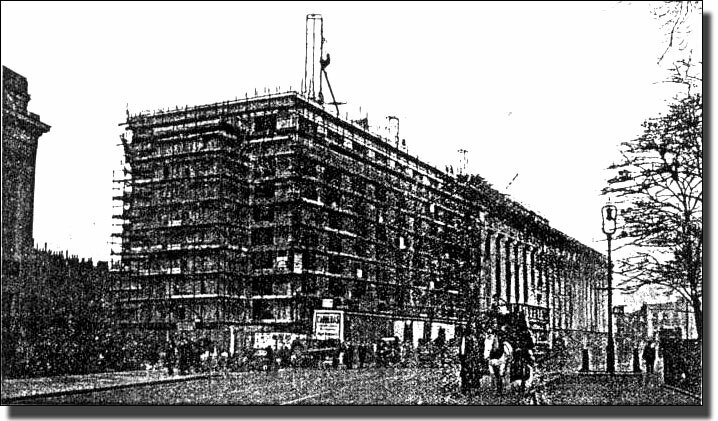 The factory which obliterated Mornington Crescent Gardens. It has now been refurbished as London House.